TALK ABOUT A RED FACE! 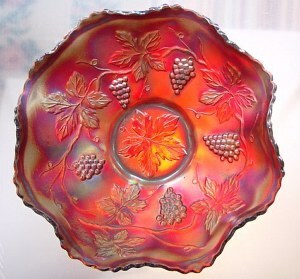 There are MANY shades of red on the faces of the carnival glass variety! The color of the glass itself can have a slag appearance, or be very deep and intense. 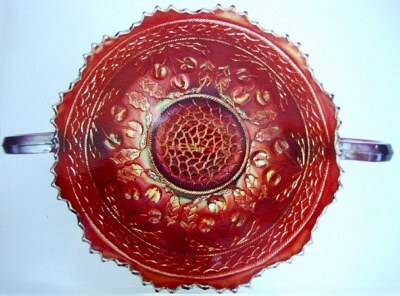 Reverse amberina is another variation; (meaning the amber color is on the bottom and the little bit of red is on the top part of the piece), but the most desirable of all is cherry red, leaving no doubt in our mind about the base glass color. 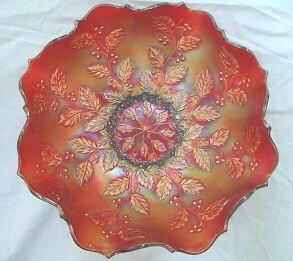 True gold is required in the mix of ingredients for red glass. Too many firings can create the “silvery” finish found on some pieces. As the “batch” of molten glass was used in pouring, another shift in intensity of color was realized. Formulas were not the “mode of the day” in the early 1900’s, so the “dump and shovel- full of silica sand and other elements required to form color was a rather “hit and miss” activity. Production results were varied. Without further “ado”, please take a look at the “red faces” we present for your assessment. This is typical coloration in these Persian Medallion bon-bons. Even the handles appear quite dark. 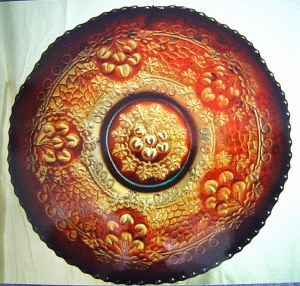 11 inch ball-footed Two Flowers bowl with light behind it. One of two known in this size (7-05-03). Perfection in Red! This Dragon & Lotus appears just as you see it.........no light in back. 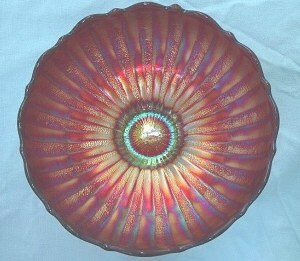 9 inch Vintage , collar-base bowl with light behind. The same 9 inch Vintage bowl as it appears to the naked eye. In spite of information written in some of the very early books on the subject of carnival glass, Millersburg did NOT make red glass! Dugan is not known to have done so either. Imperial created only a few examples, mostly in their stretch category. In the waning years of the early (1907-1917) rush to buy carnival glass, along toward the 1920’s, Northwood revived interest by creating pastels, (the ice colors), some of the patterns going exclusively to market in Australia. Not to be outdone, Fenton brought many of their former pattern “favorites” into this new market by creating the bulk of red examples collected today. They also made their own type of Peach Opal (not at all like Dugan’s example, in that it is more of an edge treatment,) along with some very desirable white, ice blue, and ice green and lime green pieces. Their ice colors are not as abundant as those from Northwood, many of which are “samples”, never really having gone into production. ADDITIONS TO: TALK ABOUT A RED FACE! Recently found in our files: We think you will enjoy seeing these two very unusual selections of Fenton Red. CHERRY CHAIN……..Reportedly an example which came out of Canada during the late `60's, this 10” ice cream shaped treasure had been in an Indiana collection until the `80's time frame, when it passed to an Oklahoma collector. It then went into a San Diego collection before arriving in a GOOD Texas home! Not long after, a Seeck auction sold the second one known, which is said to have “some problems”. The example before you has no amberina in the center. 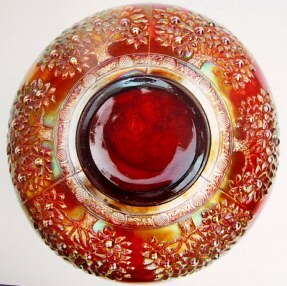 Although the center is “blessed” with gold iridescence, essentially the piece has good cherry red base glass. 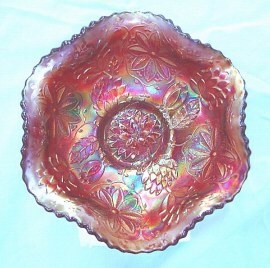 Only the outer edge of the bowl is defined with the dark red seen on many “red faced pieces”. When choices are limited, as evidenced in the restrictive numbers offered with this selection, acceptance of a piece at “face value” becomes imperative. MANY such cases present themselves in the realm of rarities. Auction price of the damaged bowl was more than $7,000. What might this perfect example bring in today's market, when prices in the $70-$80,000 price range exist for such rarity? This is more rare than a People's Vase, so we can assume someone's willingness to pay upwards of $30,000, perhaps. This estimate is based entirely upon the variation of weight difference in the two patterns in question!! That's fair isn't it? 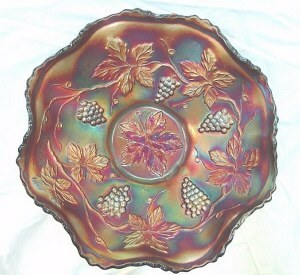 An old variety white chop plate is displayed on this website. 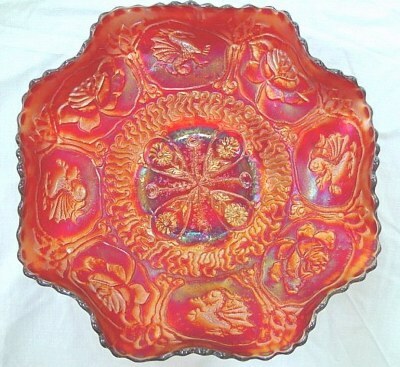 The pattern has been reissued by Fenton in bowls, plates, and a rose bowl marked with the Fenton logo. The reissued ruffled red bowls are extremely shiny. The aqua opal ruffled bowls should pose no problem in identification: Old ones were never made in that color. ORANGE TREE EXTERIOR…..This elaborate pattern is to Fenton, what Grape & Cable is to Northwood; a trademark. It was used repeatedly for primary and secondary patterning on several different shapes. This view of the Cherry Chain bowl up through the marie, relates the “ideal” true red coloration we would all enjoy having in our red pieces. Note that the iridescence on this exterior is equal to that found on the interior of the bowl!............It's PERFECTION personified! 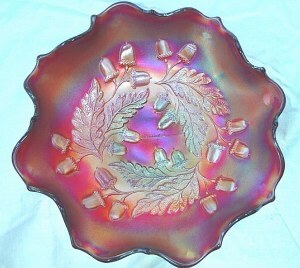 CHERRY CIRCLES……The gorgeous example pictured here came by way of John Britt, well-known contributor to this field of Carnival Glass promotion. He wrote many a detailed article for carnival glass club periodicals, and dealt, along with collecting large quantities of great glass over long years of activity. $5200 was paid for this perfect example in April 1992. The bonbon later entered a prominent KY collection for an undisclosed amount. For choice cherry red color, this example would be difficult to beat! It is thought that not more than six of these red bonbons exist. Another red example sold in 1992 for $7250, along with one having a flute broken off. It sold for $2500. 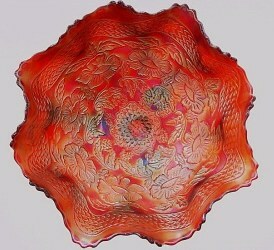 Red production from Fenton Glass extended the carnival market into the early Twenties. Perhaps orders had slowed dramatically by the time these two patterns were introduced into the line? This pattern had sold quite well in marigold, blue, green, aqua and amethyst. Any manufacturer would assume that RED would be received with as much acceptance! The last recorded sale of a red Cherry Circles bonbon was $5600 in 1996. The pattern appears only on this shape. 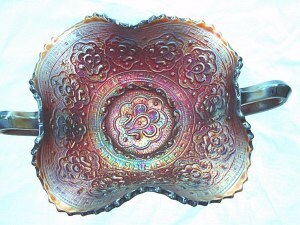 The scale band filler evident in this pattern is used in several Fenton patterns. Exterior of these bonbons is smooth. A fine parallel can be drawn between damaged glass and pieces which have no chips, cracks, etc., along with nicely distributed iridescence. No matter the price in question, low, medium, or high end price range; a piece without problems will always be more desirable should you want to sell, than one which must “be explained”. Sometimes it is not easy to find a buyer for damaged glass, simply because “value” is difficult to establish.